Hey Power People - Who’s ready for PvP in HeroSmash? I know I sure am! Let me give you the run down, on what we are working on this week. Let’s see, on my list for this week are leader boards, powers, achievements, rewards, new maps, pnpc, PvP Founder badge, new game option, and new smash coin package featuring a guest artist. We are setting up leader boards for HeroSmash PvP as I type. The leader boards will keep track of your current PvP score, and also list the top 10 PvP players. You can sort the list by Daily, Monthly, and All Time. Do you have what it takes to be part of the elite? Battle your way to glory. Another thing we are adding to PvP is Medal Achievements. We will track your game play and award you medals or trophies based on if you reach the achievement requirements. The Medal List will be found in your HALdroid as a new app. You can see what you have completed, and what is left to achieve. The medals and trophies can be upgraded as well. How cool is that? When playing HeroSmash PvP you will receive tokens. Those tokens can then, in turn be traded in to gain xp, fame, items, or even powers. Did I just say you could buy xp? You bet I did. Wow, why am I doing that? Beats me. This game just got interesting. This week we are doing a big balance overhaul on the current powers. Some that were too overpowered are getting adjusted, as well as those that are underpowered. Dumoose is working on those and will be posting a design note about that later today. As well as balancing the current powers we will be making 10-20 new powers. Some of these new powers will incorporate various elemental abilities into heals, allowing you to fine tune you powers to better suit you. There will also include some enhanced attacks, with new elemental animation. WOO HOO! I love animating effects! 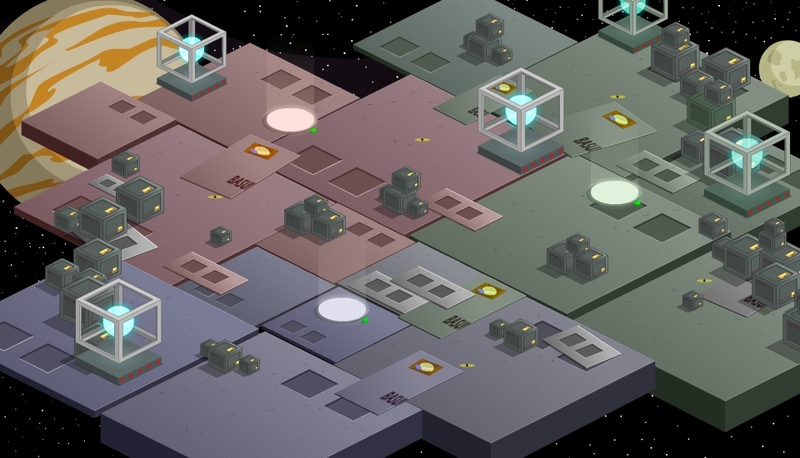 To top it all off, we are adding a NEW game to the PvP line up, Power Defense. This giant map has three power portals somewhere on it. When a portal opens up your team will have to run around and find which one is open, and stand on it to absorb its power. Once you have drained its power it will turn off, and another one will open up somewhere on the map. Run, and repeat. The other team is doing the same thing, so you must beat them up, and defeat them to get them off the portal. The first team to 1000 uses all that power to summon a wicked attack on the other team, and wins the game. This is a new and unique game that requires players to remember where the portals are, and work as a team to win. Those that have helped us test HeroSmash PvP we thank you so much. 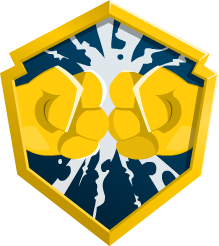 I have made the PvP Founder Badge just for you all. Remember those that want this badge must be a member and played HeroSmash PvP. If you were a member and your membership ran out before this Friday, but you were able to play PvP, then you are still eligible for the badge. The Smashdome will have its own PvP shop. And this shop needs a shop owner. We decided to make this shop owner a guest PNPC (Player NPC) that would be there, until, well, until we get around to changing it. As a special thanks to our members the first guest shop owner will be chosen from those who our PvP Founder list. Who will it be? We will be adding a special SmashCoin package to the list. It’s a $25 package (6000 SmashCoins) that will also include a special pack of rare items. The set will only last for a while, and then it will get replaced with a brand new set. The first set features a special set created by Dage the Evil, of AQW fame. 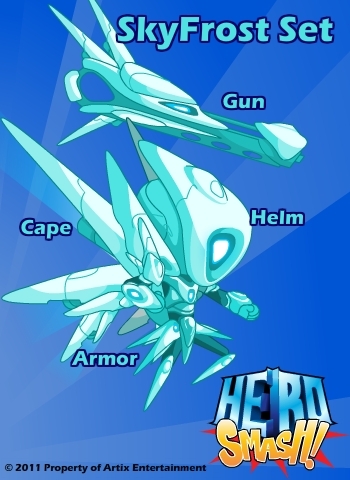 It’s the SkyFrost set, and it includes and armor, helm, gun, and cape. Once you purchase the SmashCoin package the items will automatically be put in your inventory. While you can buy the SmashCoin package as many times as you like, you will only get ONE COPY of the item set. This is one good lookin set, and not to be missed. Whew – That’s a lot of stuff to do this week. I better get to work!